We’re working on making this site even better. Stay tuned while we tweak some parts of the site to make it a better viewing and reading experience. Who says food is meant for humans? 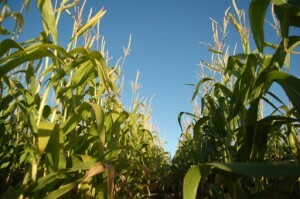 In this Eat Local NM post, I talk about corn that is grown in a farm within the city boundaries of Albuquerque. It’s neat to see that this farm is in the middle of an urbanized city. But that doesn’t defeat the purpose of getting out of the urban environment to get some fresh air and a change of scenery. The Albuquerque Maize Maze at the Rio Grande Community Farm is a way for kids and adults to have fun walking through a corn maze. Every year they design a different and difficult maze on the corn field for people to walk through. Also, while inside of a corn maze, it’s hard to keep your bearings. 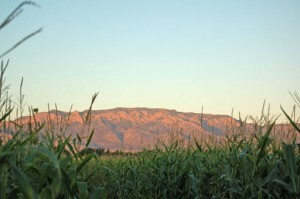 The great advantage of having a corn maze in Albuquerque is that you can sometimes find the Sandia Mountains through the thicket of corn stalks and a couple of trees on the border of the field. Other than that, you are on your own with the provided map to navigate through the field. Besides that, the corn on the field isn’t suitable for human consumption. According to their flier, the corn they grow and harvest goes toward birds. 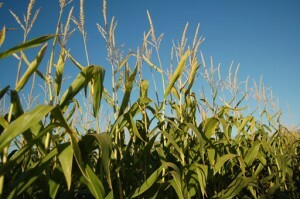 It is a kind of corn that has hard kernels and its purpose is for dry animal feed. Animals in New Mexico have to eat too, and this is a blog about food discovered and eaten in New Mexico. 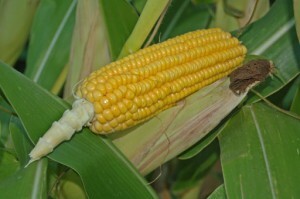 After inspecting a few ears of corn, it is simply difficult to remove the kernels. The purpose of this field is to capture the adventure of kids and adults as they traverse through a corn field. As a reminder for those who come late in the day before sunset, bring a flashlight, and light jacket, since the corn field closes well after sunset at 9 p.m. Optionally, bring a camera with you and capture your adventure through the maze!